Call it zeitgeist, coincidence, or cashing in, but these days Rome is hot. HBO is offering a new dramatic series called Rome telling stories of the empire from ground-level. But for those who prefer documentaries, The History Channel offers Rome: Engineering an Empire, airing the evening of Labor Day, to be repeated no doubt throughout the fall. Their feats aren’t just the grand monuments in the city itself, but the amazing aqueducts that fed the city, the wall built to hold out the Scots, bridges built to attack the Germanians and the public-use storefronts and baths built for Roman commoners. The show describes the innovations that allowed some of Rome’s great accomplishments. For example, concrete was known elsewhere in the world, but the Romans added a certain type of mineral that made their concrete much harder and more durable. Many of their accomplishments were possible because of a huge pool of military and slave labor. The apex of the show explains how the domed concrete ceiling of the Pantheon was created, and what a dicey proposition it was to even attempt it. As a history of Roman emperors and accomplishments, Engineering an Empire is more entertaining than most of the books I read in college on the subject. Re-enactments, cast with an eye toward the faces from surviving busts, put a face and a personality to the Roman rulers. My classics professor probably wouldn’t accept the content in two hours of television as a substitute for those books, but it’s a good overview and easy to swallow. Still, to its detriment, the show’s TV roots show through. In spite of its above-average production values, its cheapness comes through in the repetition of footage two, three, or more times. The stirring of Roman concrete and the view of the crumbling aqueduct got old after the second time. But for TV, Rome: Engineering an Empire is pretty good. The script isn’t too dumbed-down and, except for some repeated cinematography, it doesn’t feel padded. 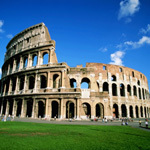 It’s a good overview of the architectural history of Rome. And it may just inspire you to check ticket prices on Alitalia.